Wyoming—Rocky Mts. Carbon Co., Medicine Bow NF: near CO state line, Continental Divide along Hwy 70, Battle Pass; 41º09'11.7", 106º58’51.8”, 3044 m. Spruce-fir forest with Vaccinium understory. Diplacus. 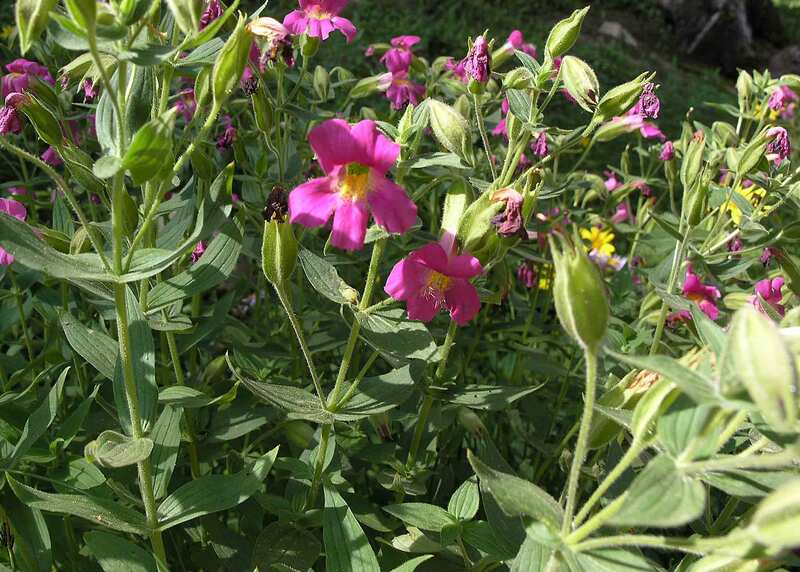 Annuals, perennials or shrubs, ~120 spp. Barker et al. 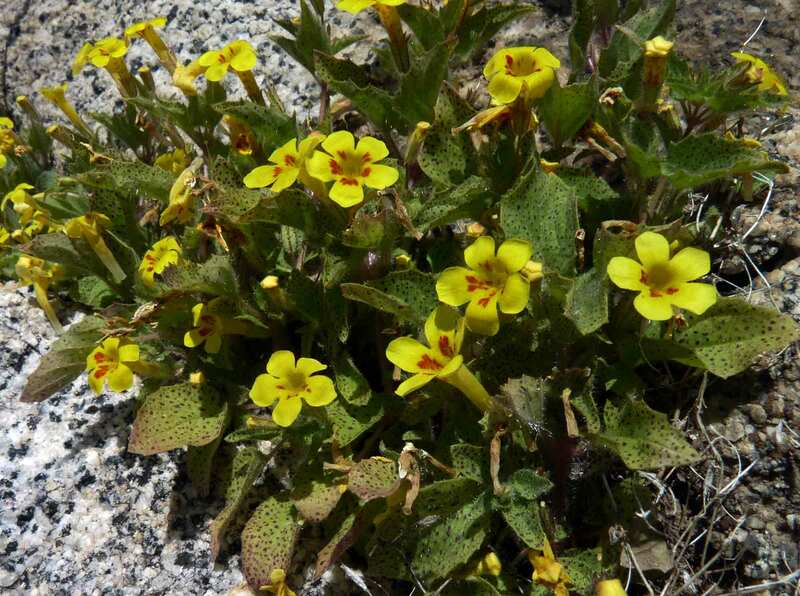 (2012) distinguished Diplacus from Mimulus by the parietal placentation as opposed to axile in the latter, and by the fruit narrowed to apex vs. truncated. 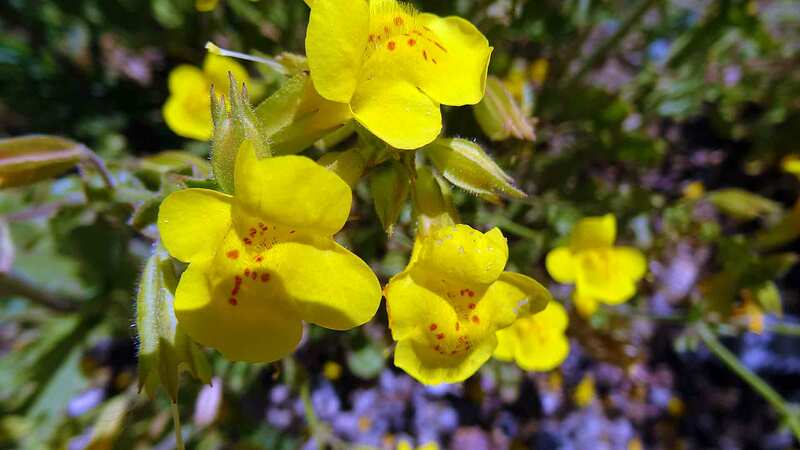 Mimulus is now a genus of only two species as a result of their “molecular-phylogenetic and morpho-taxonomic studies.” The rare annual in Kern County, Diplacus pictus, formerly in Sect. Mimulastrum is now placed in Section Eunanus. 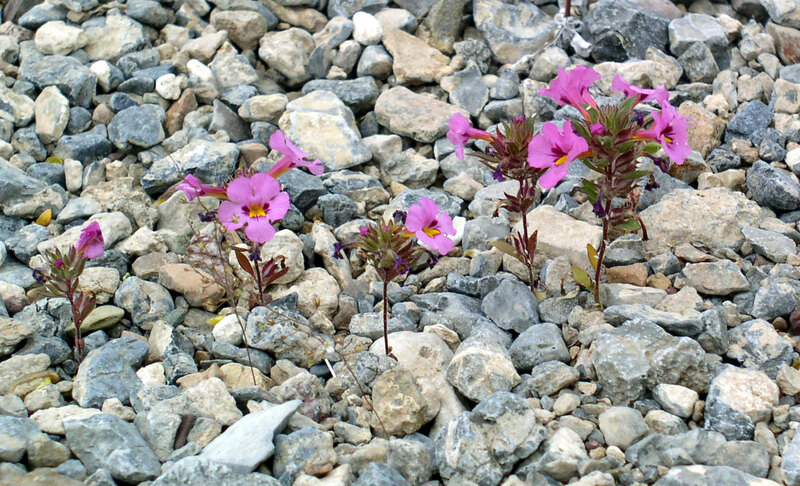 Diplacus aridus Abrams 1905 [Mimulus aridus (Abrams) Grant 1925; Mimulus aurantiacus Curtis 1796 var. aridus Thompson 2005]. 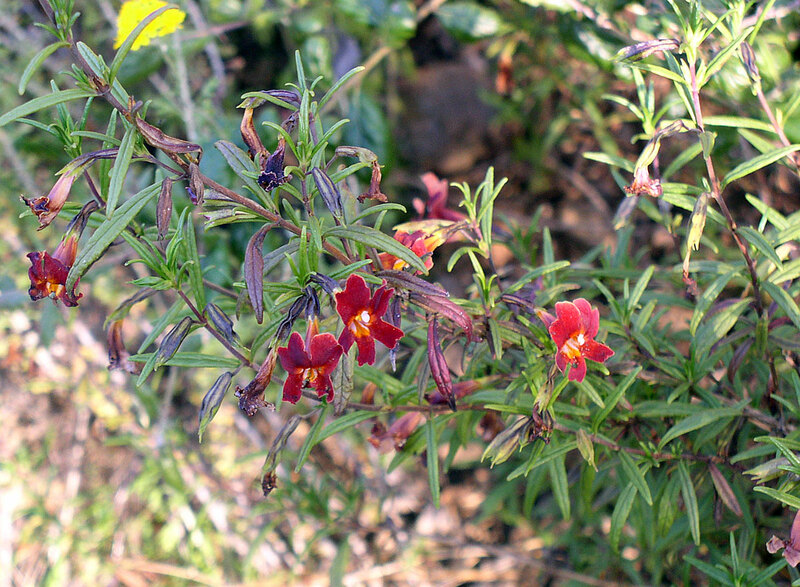 Southern bush monkey flower. Rounded much-branched shrub, stems numerous, woody, spreading horizontally and then abruptly ascending to 40 cm high; leaves opposite, glutinous, nearly elliptical to widest below the mid region, or wider above mid region, 3–4× longer than wide, 4–6 cm long, uniformly green, margins rolled under and toothed. Flowering Mar–Jul; petals 5, united into a funnel-shape corolla 3.7–5.2 cm long, pale yellow, the main lobes shallowly divided into 2 lobes, with additional small lobes or tears, surrounded by an angular inflated tubular calyx 23–40 mm. Fruit a camarium, opening along the upper suture. 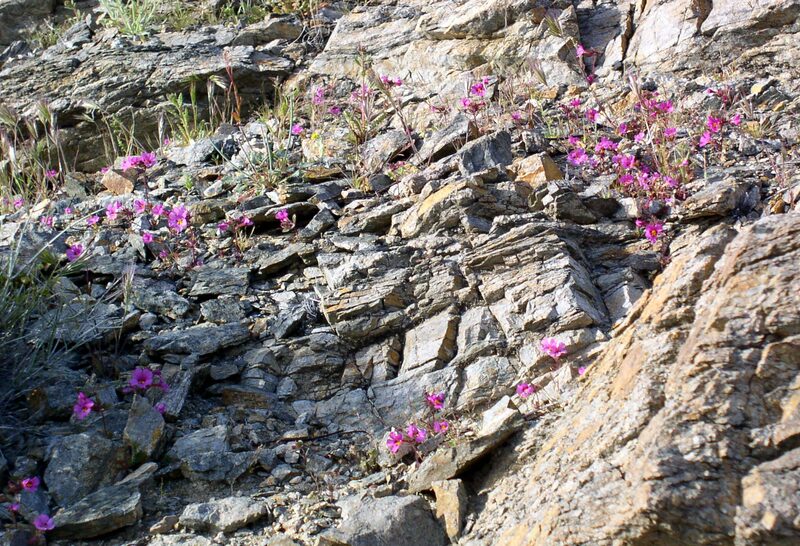 Rock outcrops below 4,000 ft, generally southern Peninsular Ranges to central Baja California with a reported disjunct occurrence in Kern Co. 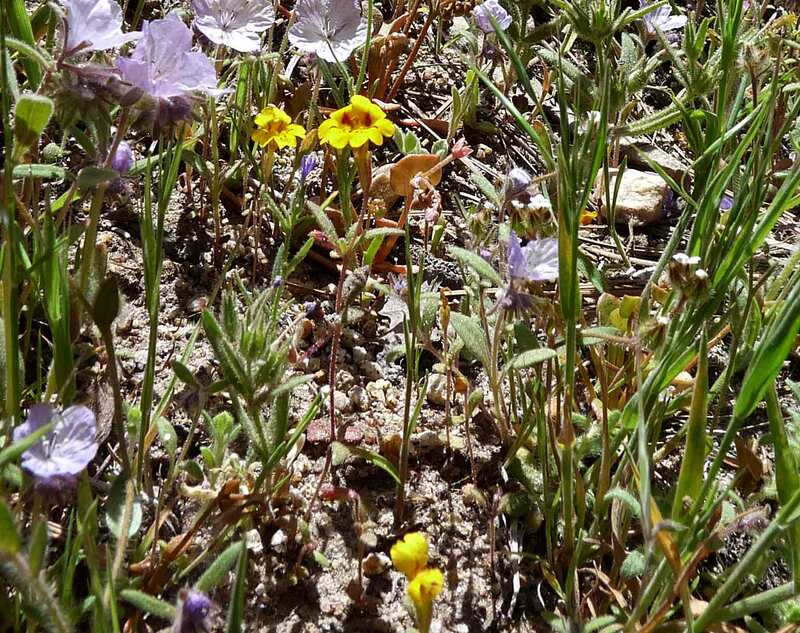 Type from Jacumba, CA. Kern Co.: Kelso Creek, between the creek and Kelso Valley Rd, 11 mi south of Hwy 178, R. S. Woglum, 10 Oct 1941, annotated by D. M. Thompson, 1992; however, this specimen was not cited in Thompson (2005), nor did he indicate the species to occur in Kern County. 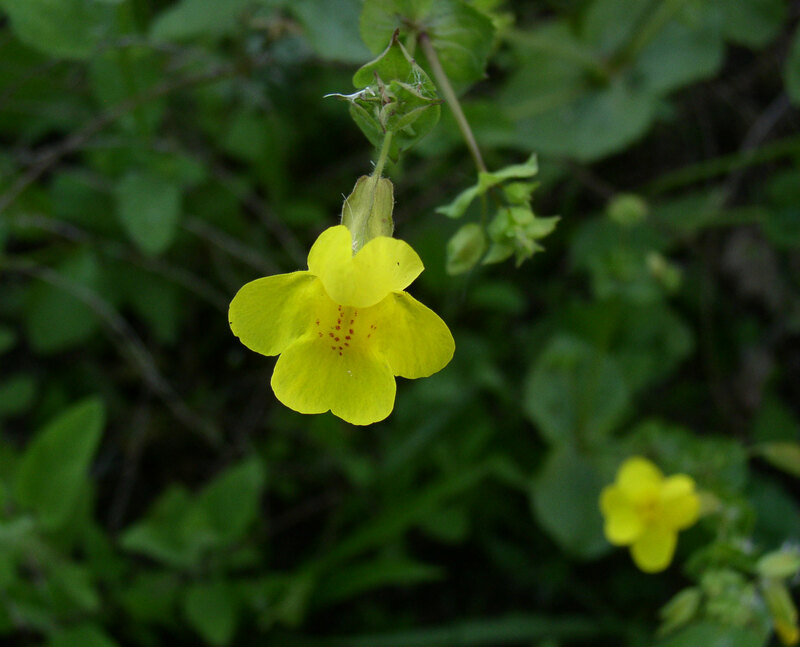 Diplacus aurantiacus (Mimulus aurantiacus Curtis 1796) Jepson 1925. 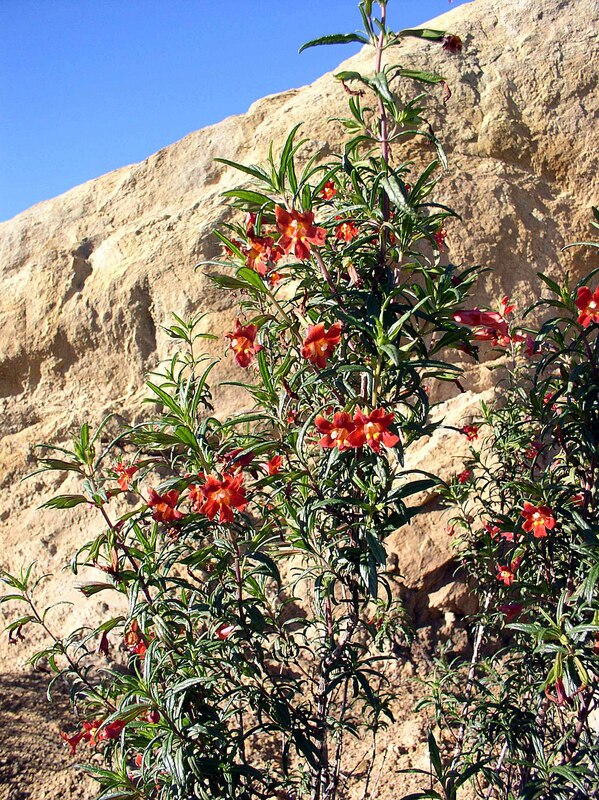 Orange Bush monkey flower. 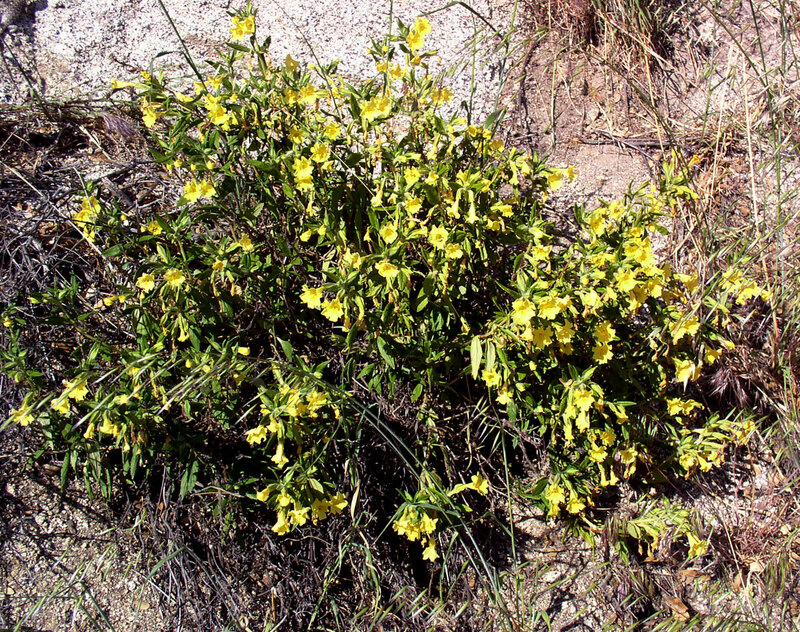 The shrub species of Mimulus in Kern County are generally treated as varieties under this name. 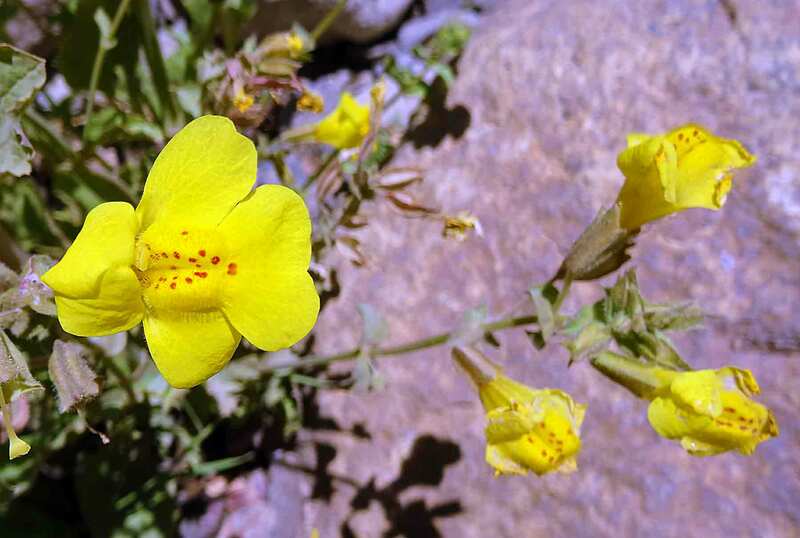 Streisfeld and Kohn (2005) found a genetic difference between the red and yellow bush monkey flower species, strictly based on color using a photometer correlated with geography in which they recognized a narrow hybrid zone. 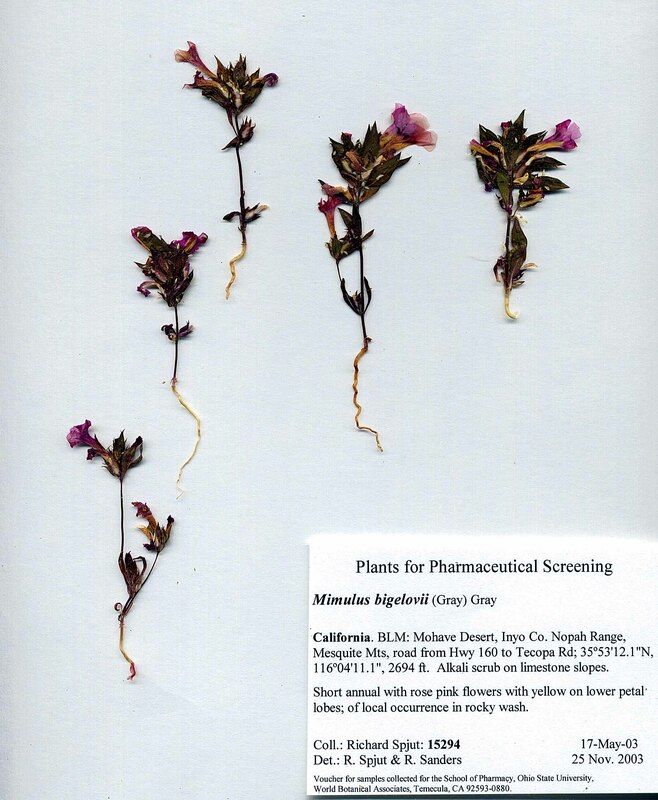 Diplacus calycinus Eastwood 1906 [Mimulus longiflorus (Nuttall 1838) Grant ssp. 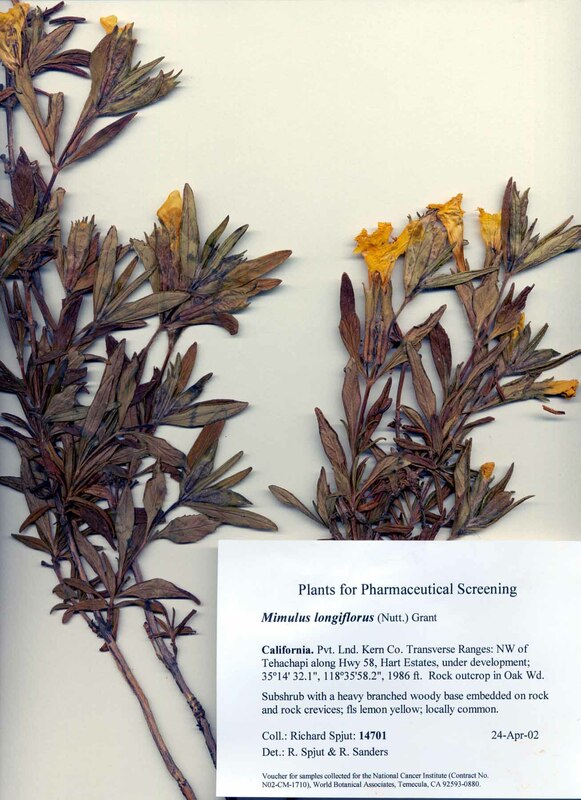 calycinus (Eastwood) Munz 1958; M. longifolius var. 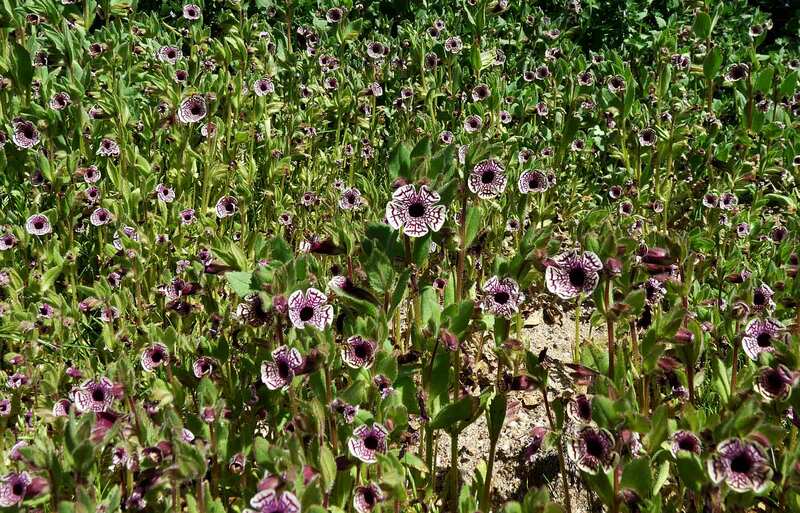 calycinus Grant 1925; D. longifolius var. 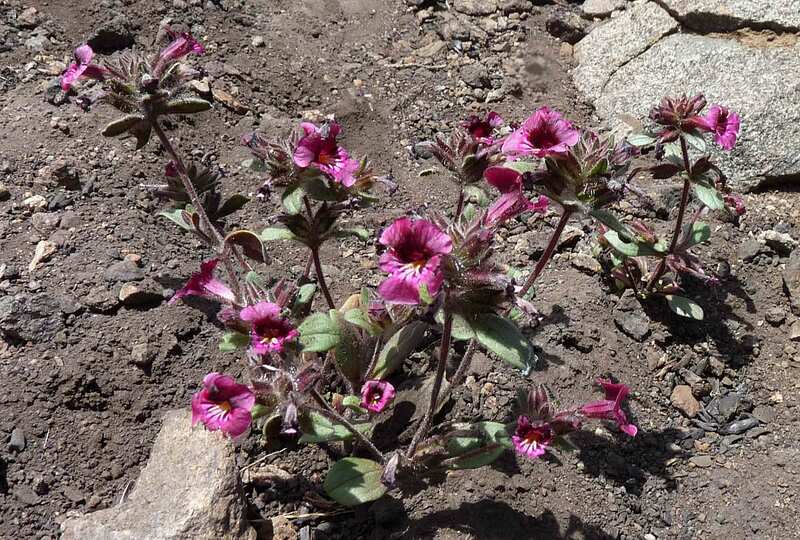 calycinus Jepson 1925; synonym of M. longifolius var. 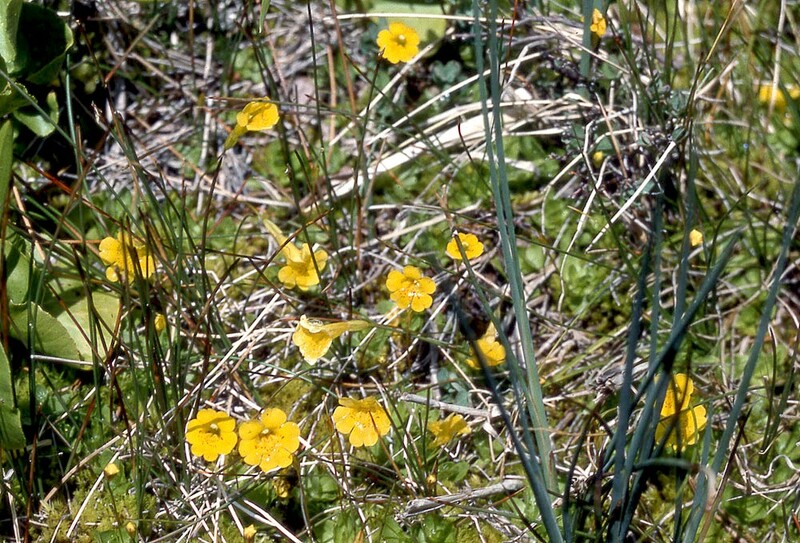 pubescens (Torrey 1857) Thompson 2005]. 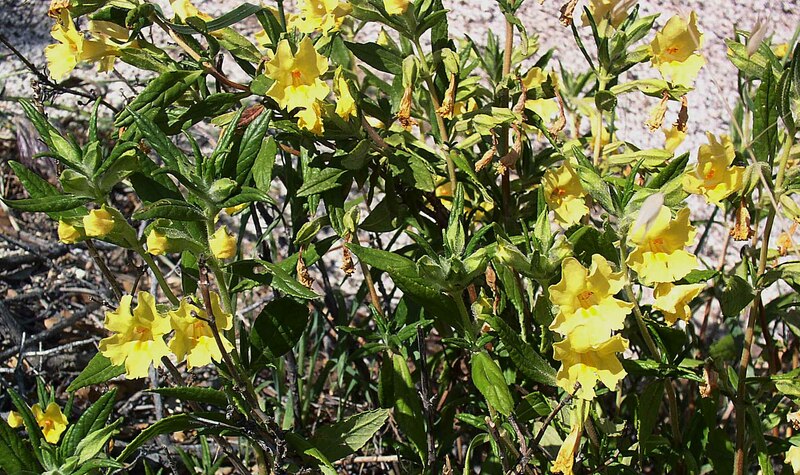 Yellow bush monkey flower. 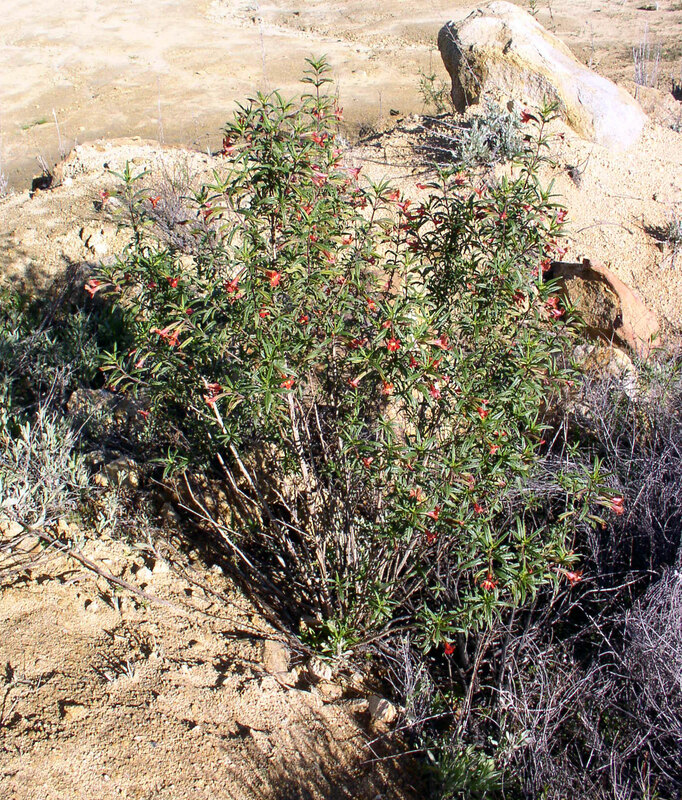 Rounded subshrub, much-branched near base, stems numerous, spreading horizontally and then abruptly ascending to 50 (-90) cm high; leaves opposite, glutinous, narrowly elliptical, 3–5× longer than wide, 4–8 cm long, upper surface shiny green with impressed pinnate and cross veins, lower surface pale green with glandular hairs and prominent raised mid vein, margins revolute (curled down) and toothed. 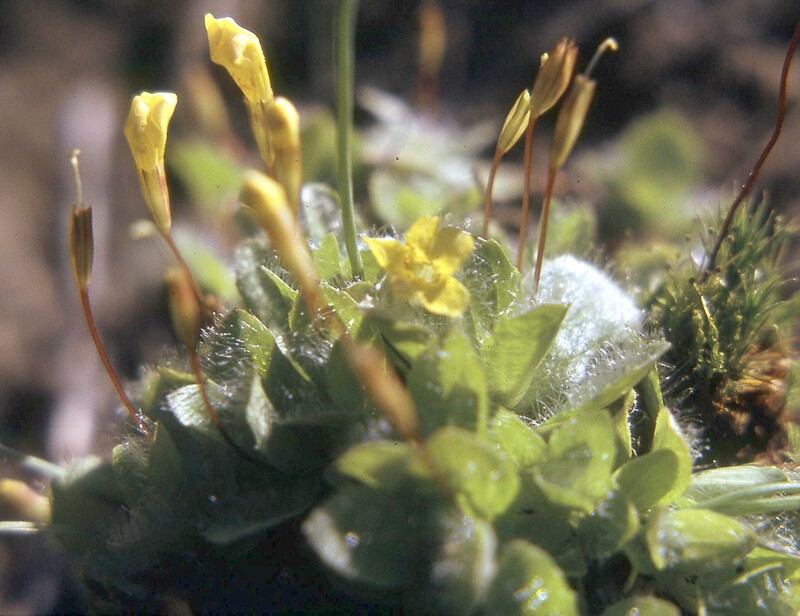 Flowers Mar–Jul; petals 5, united into a funnel-shape corolla 5.5–6.5 cm long, pale yellow, the main lobes shallowly divided into 2 lobes, with additional small lobes or tears, surrounded by a ribbed and expanded tubular calyx 25–45 mm. Fruit a camarium, opening along upper suture. Rock outcrops below 8,000 ft, oak pine woodland, mixed evergreen forest; central and southern California, Inner Coast Ranges, Sierra Nevada, Temblor Range, San Gabriel and San Bernardino Mts. Type from Tulare Co.: South Fork Kaweah River, 6000 ft,. 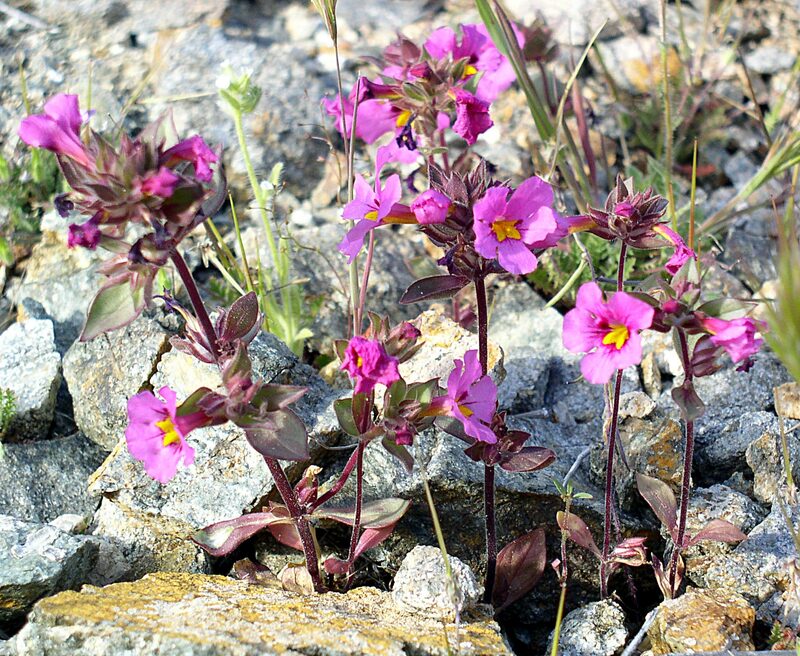 Kern Co.: Common in Kern Canyon to the desert edge, and in the Temblor Range and Tehachapi Mts., 304–1,462 m. Twisselmann recognized Diplacus as a distinct genus from Mimulus, which was contrary to his following Munz. 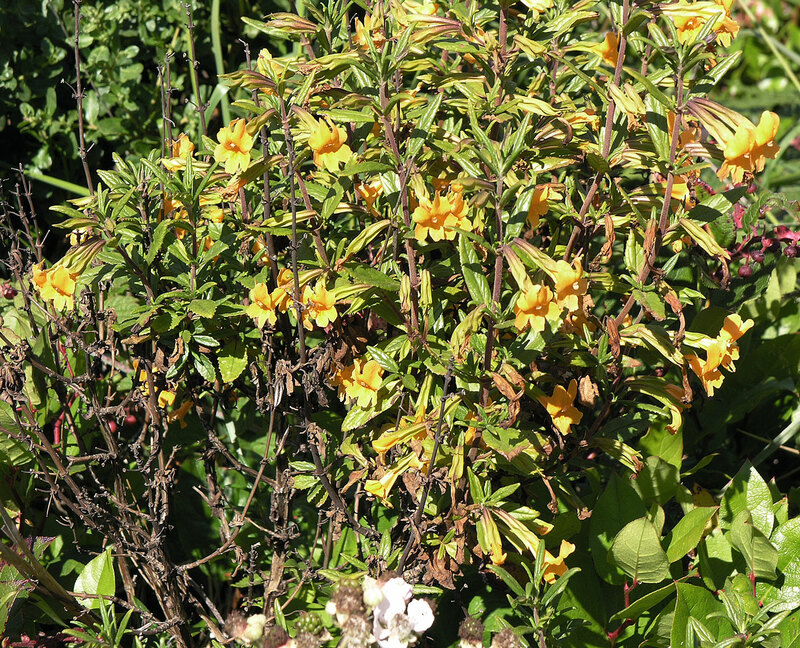 The shrubby monkey flower species had been treated in a separate genus by Jepson (1925) and by McMinn (1939) who considered D. calycinus as a variety of D. longifolius, distinguished by the sticky arachnoid hairy pedicels, and foliaceous calyx teeth. Phillips W. R, N. J. Baj, A. A. Gunatilaka and D. G. Kingston. 1996. 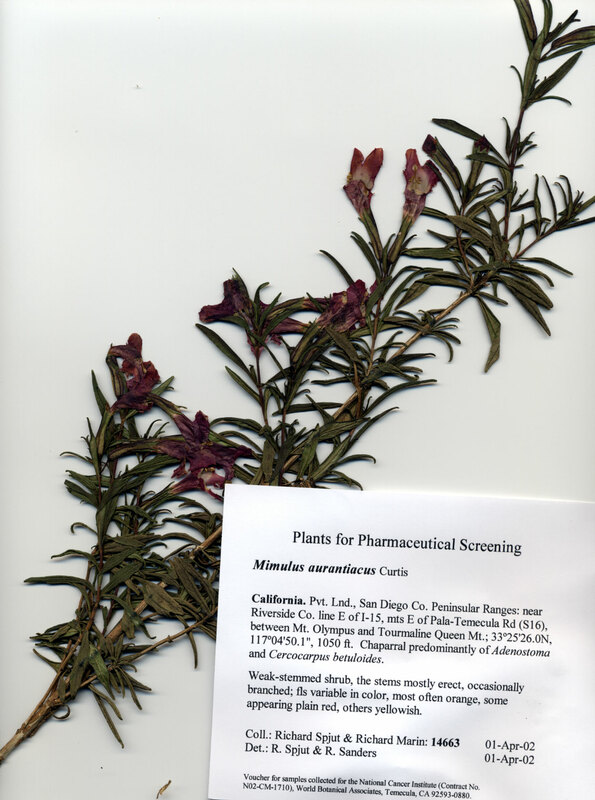 C-geranyl compounds from Mimulus clevelandii. J. Nat. Prod. 59: 495–497. 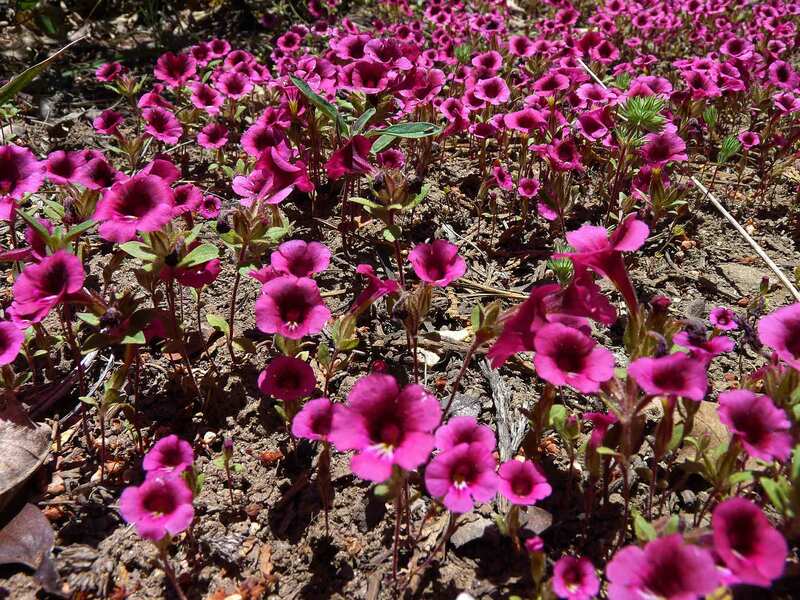 "Fractionation of the MeCOEt extract of Mimulus clevelandii yielded the novel 4-geranyl-5-hydroxy-2(3H)-benzofuranone (1) and the five known 6-geranylflavanones diplacone (2a), 3‘-O-methyldiplacone (2b), diplacol (2c), mimulone (2d), and 3‘-O-methyldiplacol (2e). 2D-NMR methods required revision of assignments for diplacone and diplacol and resolved the uncertainty in the site of methylation for the methyl ethers."